Practitioner Research in Higher Education publishes research and evaluation papers that contribute to the understanding of theory, policy and practice in teaching and supporting learning. 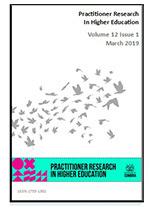 The journal aims to disseminate evaluations and research of professional practice which give voice to all of the participants in higher education and which are based on ethical and collaborative approaches to practitioner enquiry. The audience consist of a wide range of professionals involved in teaching and supporting learning in higher education. The journal aims to encourage and support new researchers and writers in higher education, including colleagues working within educational partnership organisations. Papers submitted are peer reviewed by two anonymous reviewers. Click on this link to view previous issues of the journal.